I’m hoping you all can provide me with some safe effective ways to remove moss from a roof. I just had a few large trees removed to stop the growth of the moss and now I would like to remove it. What did Google tell you . I think there is much good info there . Long term, is a zinc strip at the ridge which helps to prevent it in the future. I had the same problem on my back yard shed and I bought a product at HD that had a mix of clorox in it and it killed everything. I waited a week and then used my small pressure washer that only has 1500 PSI and it don’t damage the shingles nor remove any of the surface aggregate. Here is the before and after. Not very clear, but it came off and looked like new. Mind you, the roof shingles were 28 years old. Have a Professional do it if you are worried about damaging the shingles. UH-OH!! Planter next to the foundation… WRITE IT UP! :mrgreen: Actually that was an apple tree I cut down a few weeks before and the stuff I bought had clorox in it, but was not damaging to shrubs. Thank you, The internet has all sorts of ideas so I thought I would go to the experts and sort through the BS. Much appreciated. TSP with bleach works good. Trisodium phosphate. While black stains on roofs are a cosmetic issue, moss growth is more than just cosmetic. Not only does moss look terrible on roofs, it will also shorten the life of the roof covering and possibly lead to roof leaks. While black stains on roofs are a cosmetic issue, moss growth is morethan just cosmetic. Not only does moss look terrible on roofs, it willalso shorten the life of the roof covering and possibly lead to roof leaks. Whether you have wood or asphalt shingles, moss can grow on the roof ifit doesn’t dry properly. As with black algae stains](http://www.structuretech1.com/2011/11/black-stains-on-roofs/), the most common place formoss to grow is on the north side of the roof, but if there are enoughoverhanging trees or other forms of shade, moss can really grow anywhere. If you want to kill the moss, follow the link above that explains how toremove black roof stains; the process is the same for killing moss. Theresults certainly won’t be as immediate, but it’s effective. Today, thefocus is on what you can do to prevent moss growth on your roof. 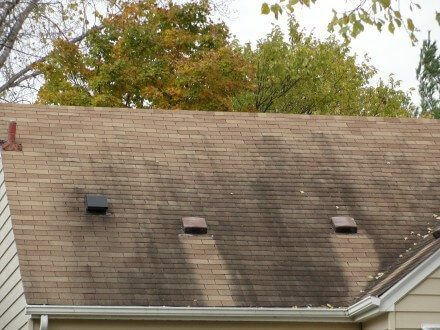 Have you ever noticed that moss and black stains don’t appear on roofsunderneath the areas with galvanized metal?